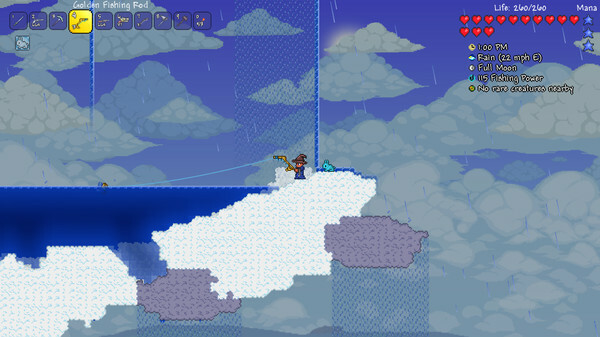 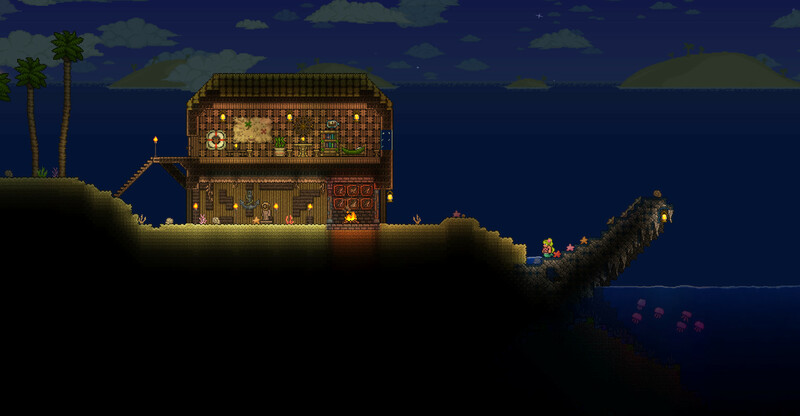 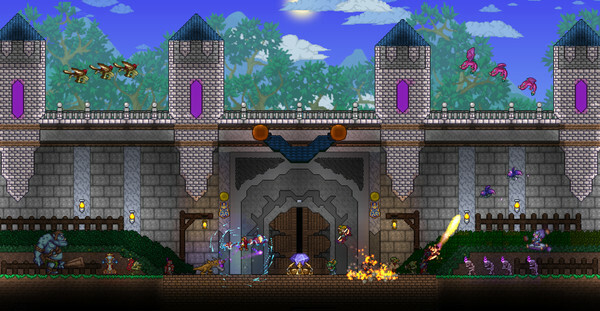 Inspired by Minecraft, Terraria is the first of a budding new genre of 2D sandbox construction games. 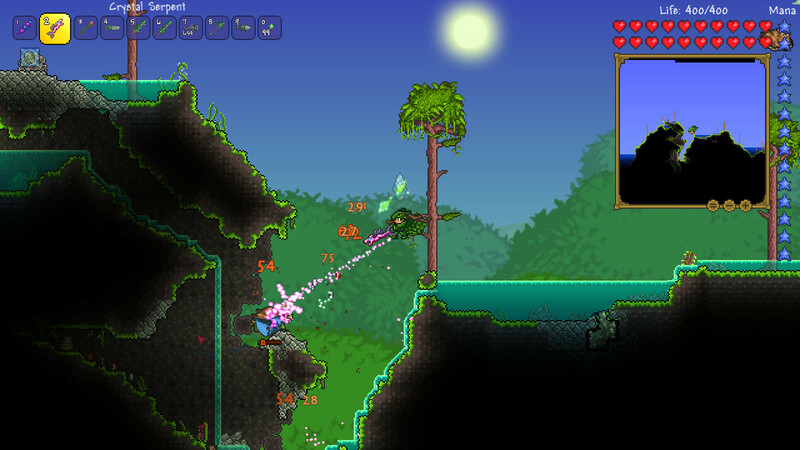 The core concept of Terraria is simple. 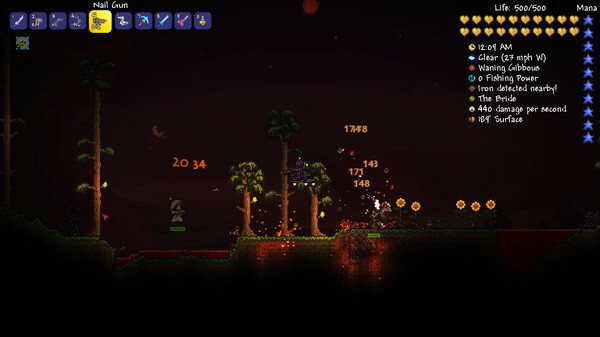 You're in a forest, surrounded by monsters, and you must survive. Talk to the guide, cut down trees, forge tools and build shelters. 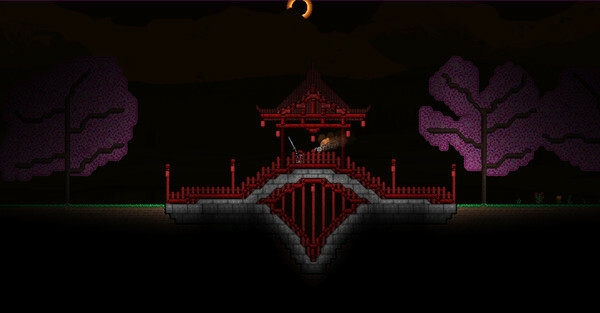 Be wary at night, for demon eyes and zombies roam freely. When you've established a foothold, it's time to roam. Terraria has an astonishing amount of depth for a sandbox crafting game. 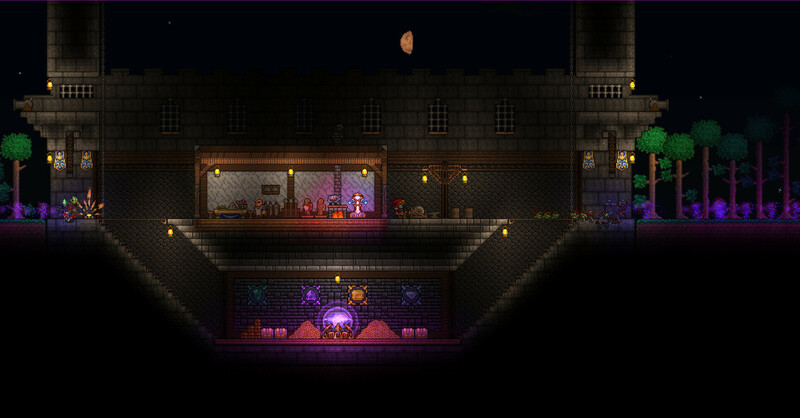 You move on from wooden tools and a simple one-room home to sprawling villages, towering turrets and armor made from the finest metals. Along the way you explore jungles, deserts, deep caverns and even the depths of the underworld. 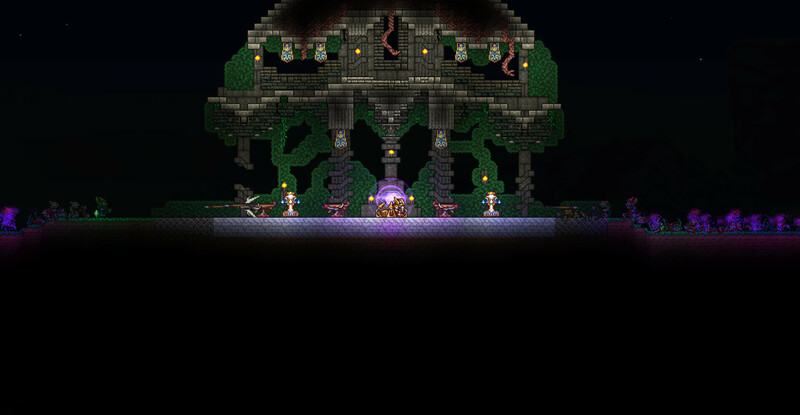 Fearsome bosses await the savvy adventurer. 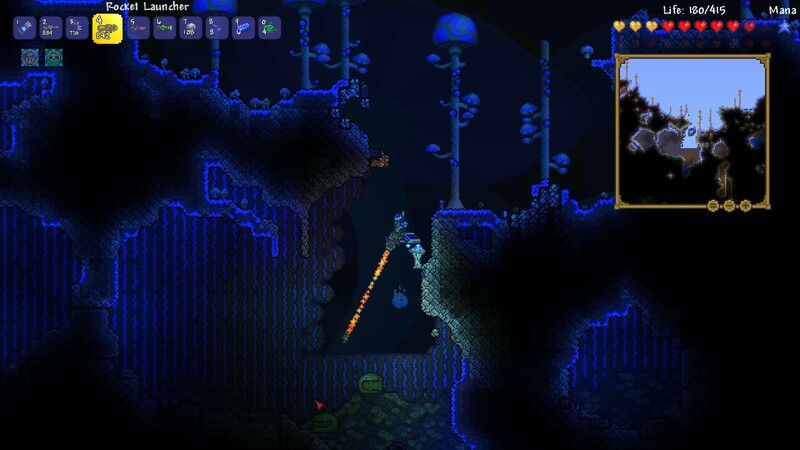 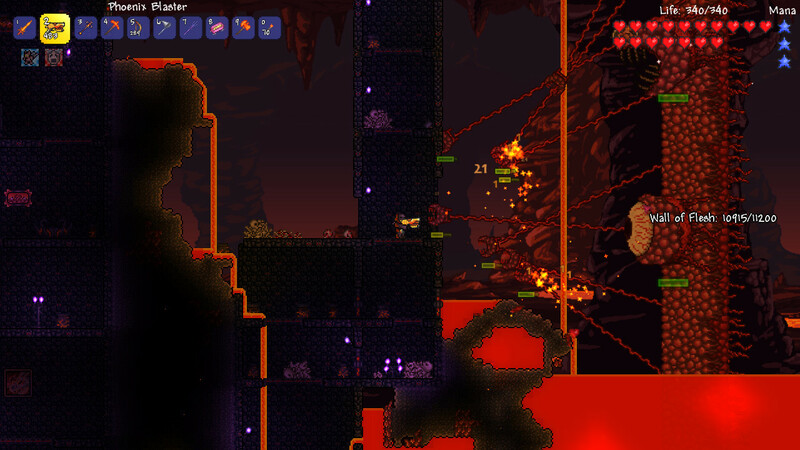 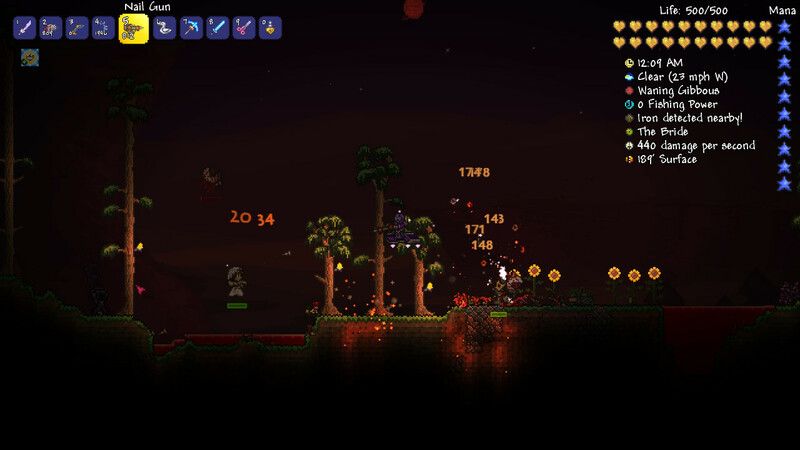 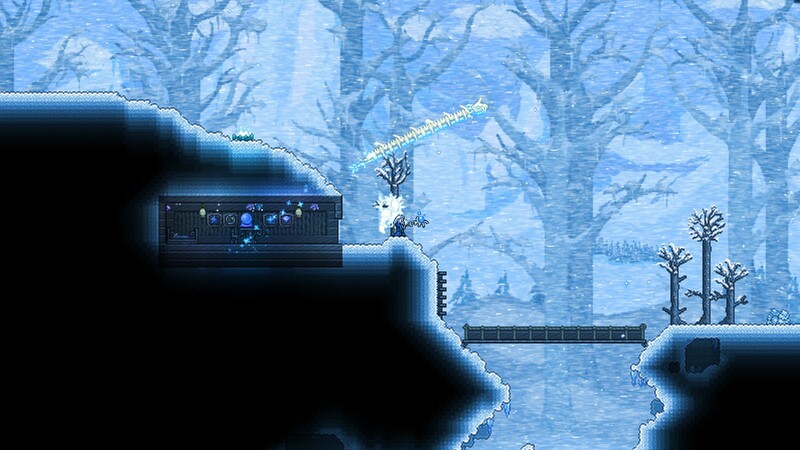 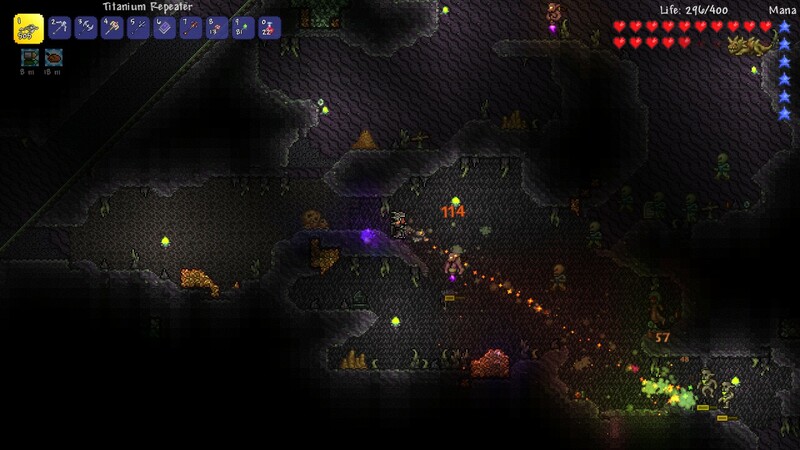 Terraria allows you to craft items to summon these foes, and the rewards are well worth it. Don't wait too long, however, or they just might show up uninvited. 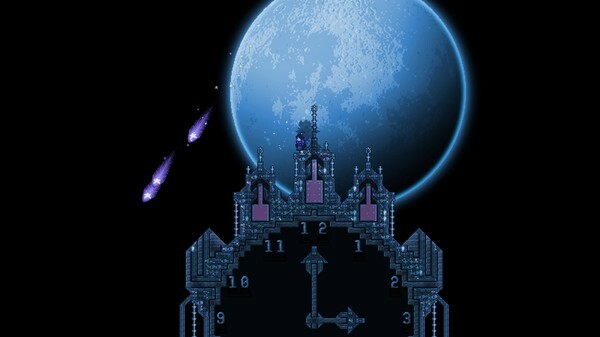 Once players have conquered the underworld, it's time to defeat the underworld boss and bring the world into hard mode. 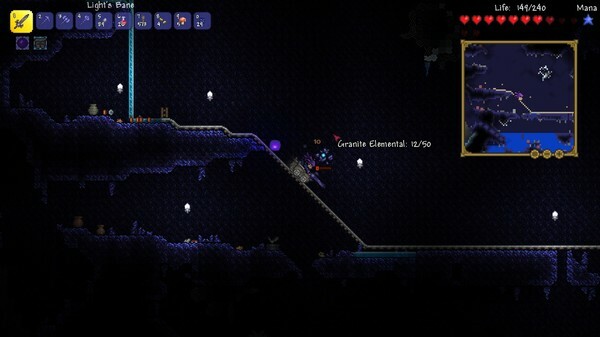 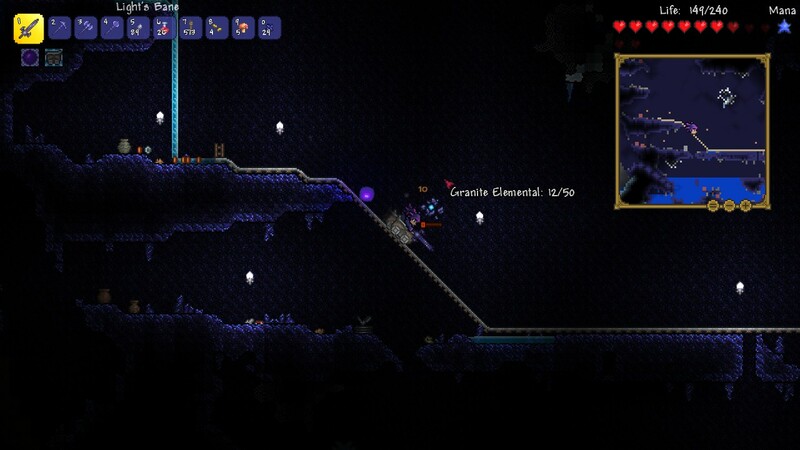 This is where the true challenge of Terraria begins. Streaks of Corruption and Hallow riddle the world, and these virulent biomes spread by the hour. 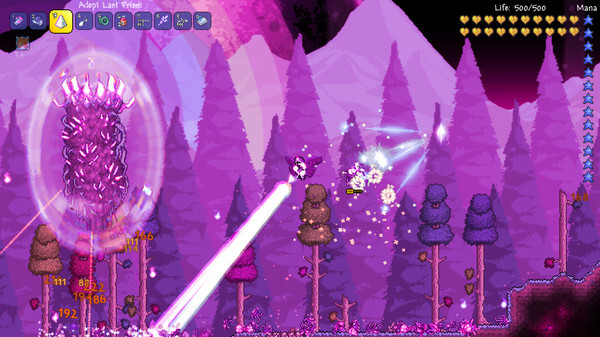 New monsters replace the old, new bosses appear and an entire new game develops. 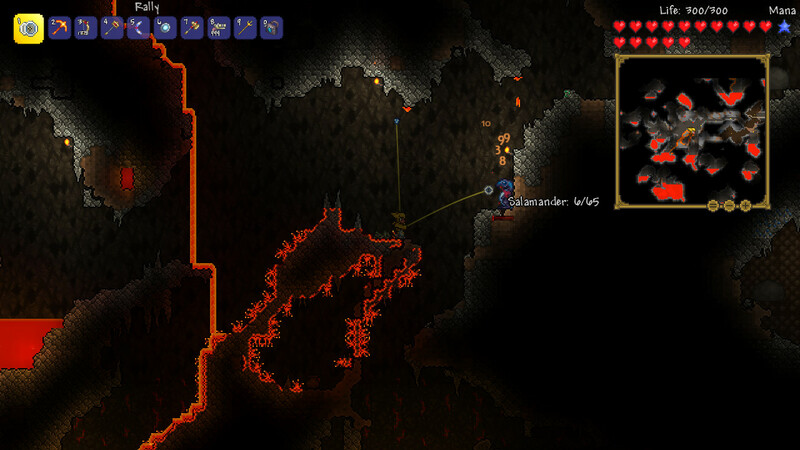 Of course, survival isn't all there is to Terraria. 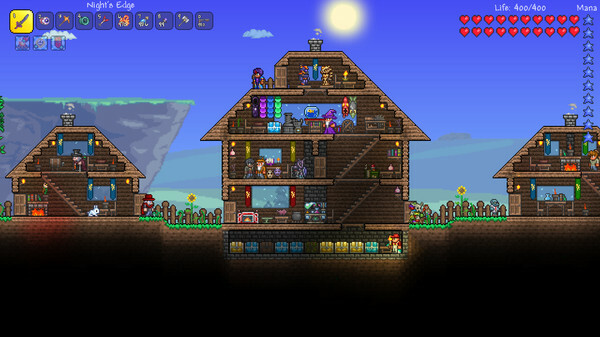 As a robust crafting engine, Terraria allows players to build anything from a simple wooden hut to a world-spanning metropolis. Wires built into the game allow simple levers and traps, which creative players can use to create anything from an airlock to a computer. Host a server or join someone else's for a fantastic multiplayer experience. 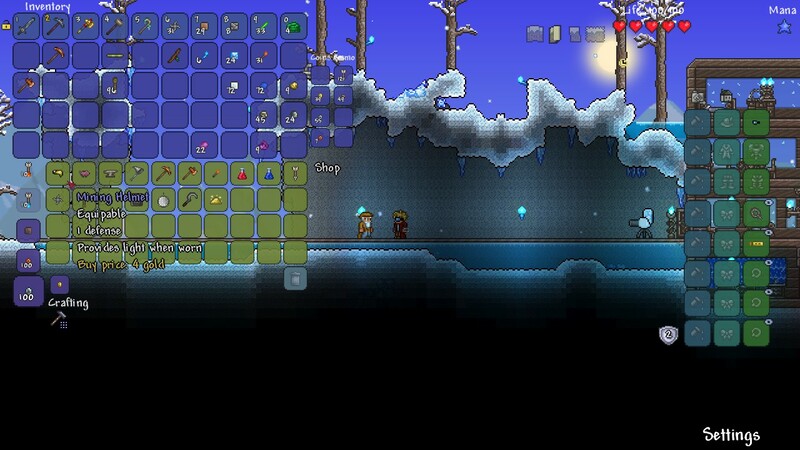 Terraria supports as many players as the server hardware can handle, up to 255 concurrent users. 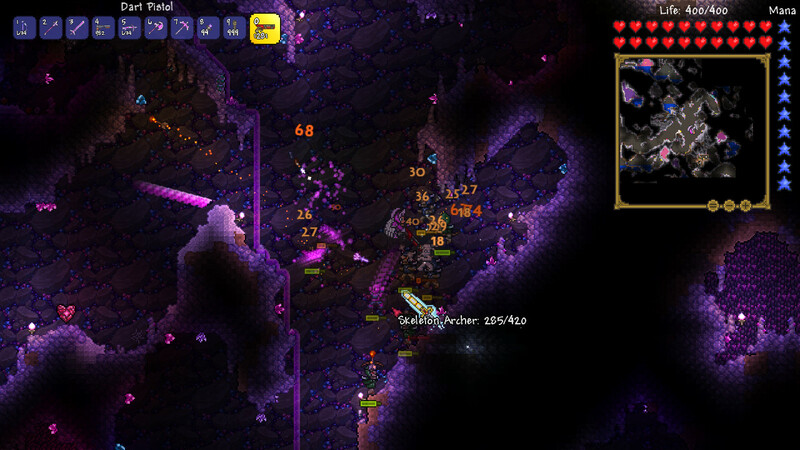 Gathering even a dozen players at once makes for a fantastic and chaotic experience not to be missed.